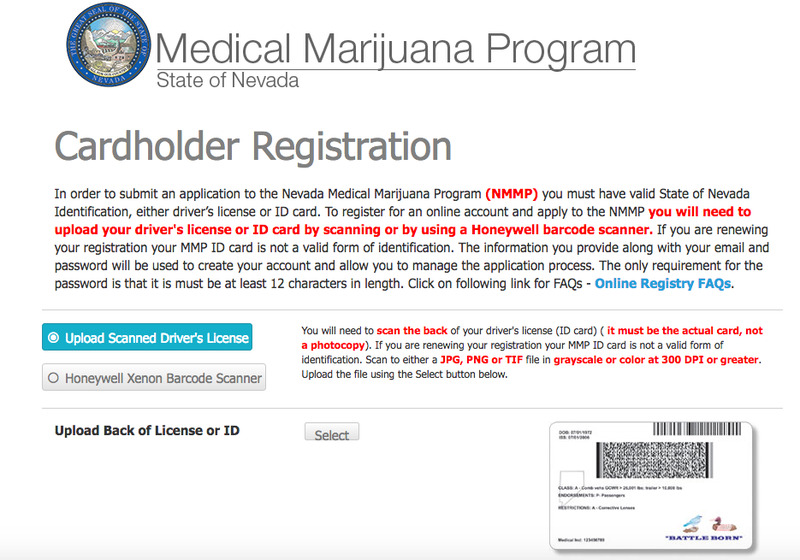 Do you qualify for the Nevada Medical Marijuana Program? Step 1: Register Online and Print your Application. Follow the steps to upload a copy of your identification card, (you'll need a digital picture or scan of the back of your identification or driver's license. Make sure the file is either in .jpg, .png, or .tif format and the quality is set to 300 DPI). Enter your email, create a password (password must be 12 characters in length) and select register. You can view frequently asked questions by clicking here. Once you have completed registration, you will have access to login to the registration portal to print your application. The username will be your driver's license or state identification card 10-digit number. Use the password that you created during registration. From here you have access to download and print your invoice (application). Once you have your application in hand, you are free to visit any doctor you choose. Some doctors specialize in medical marijuana recommendations and may require medical records to support your need for medical marijuana. Our friends at Cohen Medical Center and Paradise Clinic are offering inexpensive doctor consultations. To set up an appointment call Cohen Medical Center (702) 564-6420 or Paradise Clinic at (702) 255-6272. Most doctors have a notary on staff to notarize your waiver and acknowledgement forms, both Cohen Medical Center and Paradise Clinics offer notary services. Step 3: Upload your completed paperwork to the MMP. Once your paperwork is completed by your physician and notarized, as well as your doctor recommendation and notarized waiver and acknowledgement forms, you can upload it directly to the MPP website (the same website where you registered your account). Letters of approval can come as quickly as 24 hours. Once received, your recommendation may be printed, allowing access to dispensaries. Step 4 (Final Step! ): Wait for your card in the mail. Patients no longer have to go to the DMV to obtain their physical cards. The DPBH and the DMV are now working together so that cards are directly mailed to patients. Once you receive your letter of approval, your card will be automatically mailed to your address on file. Understanding the Nevada Medical Marijuana Laws. It's also important to understand the Nevada medical marijuana laws before diving into your consultation for a recommendation. NRS 453A allows for medical patients to posses up to two and one-half (2.5) ounces and/or a maximum allowable quantity of edible marijuana products and marijuana-infused products as established by regulation of the Division. If you are planning on growing your own medicine, you can grow twelve marijuana plants, irrespective of whether the marijuana plants are mature or immature (defined in NAC 453A.080). However, you must live at least 25 miles away from a dispensary. The registry card is issued for use in Nevada, and may not be recognized in other states. Your registration is good for one year, after that you will have to renew the card's registration. They drive, operate, or control a vehicle or vessel under power or sail while under the influence of medical marijuana. Unlawful amounts of marijuana in the blood or urine, per N.R.S. 484.379, are 10 nanograms per milliliter of urine and 2 nanograms per milliliter of blood. They water ski, surfboard or use any similar device while under the influence of medical marijuana. They operate an aircraft while under the influence of medical marijuana. They have physical possession of a firearm while under the influence of medical marijuana. They embark on an amusement ride while under the influence. The possession of the marijuana or drug paraphernalia is discovered because the person engaged or assisted in the medical use of marijuana: 1. In a public place. 2. In a detention facility, county jail, state prison. 3. While delivering marijuana to another person, even if they hold a registry card. A cardholder cannot be a caregiver to another cardholder. Proof that the applicant is a resident, including, without limitation, a photocopy of a driver’s license issued by the Department of Motor Vehicles or a photocopy of an identification card issued by the Department of Motor Vehicles. We hope we have helped answer your questions on how to obtain a Nevada Medical Marijuana card, if you have any questions please feel free to reach out to us directly at info@apothecariumlv.com. Wishing you the best of luck in your medical endeavors.